Eli’s Golden Apple is a locally owned and operated restaurant that offers a wide selection of home-style favorites in a casual, relaxing atmosphere. On each visit, you and your guests will enjoy our Chef’s daily menu, which draws from a repertoire that has made Eli’s Golden Apple Restaurant & Pancake House one of the premiere restaurants in the country. We are happy to welcome everyone to our restaurant. Eli’s Golden Apple Restaurant & Pancake House is a family-styled restaurant that offers all of the traditional comfort foods made with that homemade touch. If you liked grandma’s meatloaf and mashed potatoes, you’ll love the food down here. 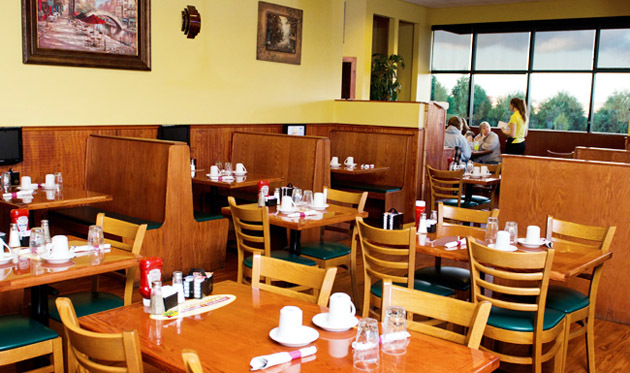 When you visit Eli’s Golden Apple Restaurant & Pancake House, you will be treated like a member of the family. We love people and want everyone to have as enjoyable an eating experience as possible. From the time you walk through the front door until the time you are ready to leave, our waiters and waitresses will give you the friendliest, most attentive service in Northwest Indiana. You won’t have to ask for water as we make sure everyone starts off with a nice cool glass before they order their meal. 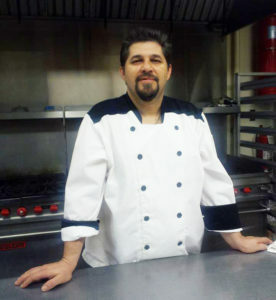 Mr. Kajmakoski is the Executive Chef and Owner of Eli’s Golden Apple Restaurant & Pancake House in Crown Point, Indiana. Our extraordinary eating establishment is a family restaurant which serves a menu full of unique recipes that Ilija created over his 27 plus years as a chef.